Today I’m really happy to have Chelsea Frank on the show. Chelsea is a student in my Create A Profitable Online Store Course. She joined over a year ago and she’s been doing really well with her business LifeAndLimbGel.com. 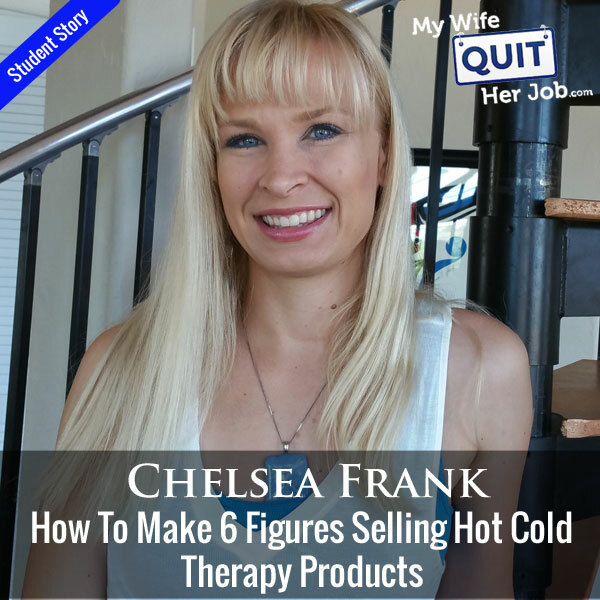 Chelsea sells hot and cold therapy products on both her online store and Amazon. But these are no ordinary hot/cold packs. They are designed to contour to your body for a perfect fit. In fact, Chelsea sent me a sample long ago when I hurt my knee and the quality of her product instantly resonated with me. Anyway, today we’re going to dig deep and find out how Chelsea came up with her design and how she managed to get the word out about her therapy products. Did you enjoy listening to Jen’s story? If you would like to create your own profitable online store and join a community of like minded entrepreneurs, then sign up for my full blown course on how to create a profitable online store. Steve: You’re listening to the My Wife Quit Her Job Podcast, the place where I bring on successful bootstrapped business owners, and delve deeply into what strategies are working and what strategies are not in business. Today I have an extra special guest from my Create a Profitable Online Store of course. Chelsea is a student in my class who is doing really well selling hot and cold therapy packs. Now what’s funny about these student interviews is that I bring them on the podcast without any knowledge of their situation, and there’s pretty much zero preparation whatsoever. Anyways, when I interviewed Chelsea I was surprised to hear that she was down to her last one $100 in her bank account, and that she needed to start her business just to bring food on the table. Enjoy the interview. Before we begin, I want to give a quick shout out to Klaviyo who is a sponsor of the show. Always excited to talk about Klaviyo because they are my email marketing platform that I personally use for my store, and I depend on them for over 20% of my revenues. Now, Klaviyo is the only email platform out there that is specifically built for ecommerce stores, and here is why it is so powerful. Klaviyo can track every single customer who has shopped in your store and exactly what they bought, and that makes it extremely powerful. So let’s say I want to send an email out to everyone who purchased a red handkerchief in the last week, easy. Let’s say I want to set up a special auto-responder sequence to my customers depending on what they purchased, piece of cake, and there is full revenue tracking on every single email. Klaviyo is the most powerful email platform that I’ve ever used and you can try them for free at mywifequitherjob.com/K-L-A-V-I-Y-O, once again that’s mywifequitherjob.com/K-L-A-V-I-Y-O. I also want to give a shout out to Privy who is also a sponsor of the show. Privy is the tool that I use to build my email list for both my blog and my online store. Now Privy is an email list growth platform, and they manage all of my email capture forms, and in fact I use Privy hand in hand with my email marketing provider. There is a bunch of companies out there that will manage your email capture forms, but I actually like Privy because once again they specialize in e-commerce. Right now I’m using Privy to display a cool wheel of fortune pop up. Basically a user gives their email for a chance to win valuable prizes in our store. And customers love the gamification aspect of this. And when I implemented this form using Privy, email sign ups increased by 131%. So bottom line Privy allows me to turn visitors into email subscribers, which I then feed to my email provider to close the sale. So head on over to Privy.com/Steve, and you could try the tool for free. And if you decide you need the more advanced features, use coupon code MWQHJ For 15% off. Once again that’s P-R-I-V-Y.com/Steve, now on to the show. Intro: Welcome to the My Wife Quit Her Job Podcast. We will teach you how to create a business that suits your lifestyle so you can spend more time with your family and focus on doing the things that you love. Here is your host Steve Chu. Welcome to the My Wife Quit Her Job podcast. Today I’m really happy to have Chelsea Frank on the show. Now Chelsea is actually a student in my Create a Profitable Online Store course. She joined over a year ago, and she’s been doing really well with her business lifeandlimbgel.com. Now she sells hot and cold therapy products on both her online store and Amazon as well as a few retail stores, but these are no ordinary hot cold packs. They are designed to contour to your body for a perfect fit. And in fact Chelsea sent me a sample long ago when I hurt my knee, and the quality of her product instantly resonated with me. Anyway today we’re going to dig deep and find out how Chelsea came up with her design, and how she managed to get the word out about her therapy products. And with that, welcome to show Chelsea, how are you today? Chelsea: Hi great, I’m doing great, thank you so much for having me on. Steve: Yeah Chelsea, it’s actually been — I just checked, it’s been almost two years at this point, and I’ve always been curious how did you come up with the niche for your online store and your product? Chelsea: Well, it’s actually a funny story. I had a background creating artificial arms and legs and prosthetics and orthotics. And when I was working during my residency, I kind of stumbled upon inventing this shoulder orthosis. And I was kind of upset about having to do it, because it took away from my real job. But all of a sudden I was really proud of myself for creating something that was making the company like hundreds of thousands of dollars, and really helping our patients. And so I kind of decided, wow this is really cool, I like to make things and come up with all these fabrics and meet all these different people and different areas of like plastic molding and all that stuff. And so six months later I lost my job. And so it was kind of a blow. They wanted me to keep making that product for them, but I knew it wasn’t going to last. And so I just kind of said, you know what, this is my opportunity to kind of take this to the next level and see what I could do. And I had invented a — they wanted me to invent a better shoulder ice pack that went inside of the ice wrap that I was creating. Steve: So they laid you off and then they wanted you to invent a product for them? Chelsea: Of course yes, after me making hundreds of thousands of dollars for them. Yeah that was kind of the way it goes. So kind of stinks, but at first I said no, but then I started looking into the profit margins of hot cold therapy packs, and they were huge. And I thought who makes these things? They’re usually made overseas, they’re made a lot of times with nontoxic or toxic or subpar ingredients that you really wouldn’t want your children to be around them if they get punctured. And so I just kind of thought, this is my one chance. I got laid off, my husband at that time had moved our family, and we were living in poverty literally. Chelsea: So yeah, so and I had my second baby on the way. So we went to the tribe, my husband is a tribal member and borrowed money with $100 in the bank. So we shared our idea, pitched it to them, they loved it and they really kind of took us under their wing and helped us get in a position to where we could do this product. Steve: May I ask how much money you started with? Chelsea: So my grandpa had given me like $4,000, and it just wasn’t really going to be enough to scale it. I had some different plans with different materials and they weren’t working out. And so we only borrowed $7,000, but we had like $100 in our name. That was literally all that we have in the bank. That was pretty much it. Chelsea: Yeah so the original product that I had created was a shoulder orthosis, and the shoulder is — it’s kind of pokey out and it’s hard to ice. A lot of times when people have a surgery, they’re compromising their other shoulder trying to hold the ice pack on, and it’s just – these body parts are all made differently, not really universal. And gel packs are just kind of a big chunky block that you hold in place. So I thought, well why not create these just like an orthosis and just like a wrap that’s custom designed for each part. So what I started with was the shoulder, and it’s a little pou — little pouches that slide the gel pack in with specialized strapping that straps the pack in place and really contours to the body. The gel is flexible when it’s frozen, it allows a little bit of conforming and it’s also a little bit rigid so it’s not going to just lose out all around. And the specialized inner fabric is laminated to a thin four way stretch plastic, so it keeps the skin from getting too cold or too hot, and allows the penetrating cold and hot therapy to just really reach those muscles at the right temperature without any thermal damage, and prevents that leaky watery mess that you get from most standard gel packs. Steve: So here’s the thing, Chelsea when I received your product it was very high quality, and you mention that most of these things are made in China. Do you actually make all the stuff yourself, do you make it overseas or? Chelsea: Yes, so I originally started out making every single thing by hand, and there’s about 22 components that go into each of our wraps. We have about five or six different wraps. And now I have four employees who make all the products. I don’t really do a whole lot of the selling or anything right now, but they’re still all handmade here in the USA. And we’re pretty proud of that, it’s really hard to compete against the margin, the other place. But I thought if we can do this and if we have great margins set up, it’s only going to get better as time goes on and as our abilities to purchase larger quantities. Steve: Do you have a sewing background? Chelsea: Not really. I mean I saw here and there, but in doing prosthetics and orthotics, you work with industrial equipment and industrial sewing machines. And so they were just — yes a little bit. Steve: And how did you source all the materials, and how did you get started with this? It seems pretty complicated to me actually. Chelsea: It is. I am a very good Google searcher I guess. I don’t know how else to say it. I spent hours trying to find the exact fabrics which are all taken off of materials that we had received from China, and just trying to figure out what is this, how can I make it better? Steve: So the materials you source from China, sorry? Chelsea: No I don’t, I get all the materials here except with this strapping is one thing that just making it here in the US, the price is just not quite good enough for me to buy. So I buy from US suppliers, but they are from China. Chelsea: So there’s a couple of parts, but yeah, so just figuring out what works and talking to people like I know what I’m doing. There is a little bit of faking it. Steve: How many suppliers do you work with? Chelsea: Well let’s see, if there’s 22 parts, probably about ten to 15. Steve: Ten suppliers, wow okay. Chelsea: So yeah it’s a lot of — the labels come from different company, and it’s just like everybody is just kind of like a one niche thing. They do one thing really good and so they can’t supply me with everything. Steve: And in terms of the assembly, is that done at your own factory? Chelsea: Now my employees — it used to be — I mean literally these are made in-house meaning in my house. Chelsea: Yeah, so we all come together about one day a week and work making these products all together, and during the rest of the week they’re kind of in their own houses with their own set up. Chelsea: So they’ve have my equipment at their houses, and then they kind of work during their free time and kids are at school. Steve: Wow okay, so my immediate reaction is you should be charging a lot more for these products. I mean I thought it was a bargain based on what you’re charging on your site. Chelsea: And we should, but we’re not — a lot of the things we’re still even if we’ve been around for five years, we’re still in the beginning stages. Yeah it would be nice and we definitely should, people will pay more for them, but we are moms, we all started out not making very much money. And so we really like to cater to everybody, we want everybody to have one of these if they have a surgery. And it’s so much more affordable, and it really helps with reducing pain and swelling after surgery. Steve: So when you were designing these for that company that you used to work for, you obviously got to own the brand right, you were selling your products to them. Chelsea: Oh yes, so I didn’t — I gave them a product that was not labeled with my brand, and I created my brand after, so yes. Steve: You had full rights to everything, right? Steve: Okay, and so did you do any like validation before you invested that money? Chelsea: Yeah, well it’s funny because I would look at the other competing products and I would really want to like touch them and feel them. And I was just like I can’t even justify buying these things for $80 a piece. I didn’t have that much money to even start out with. So I thought, well I just kind of went for it. I thought the margins are there, I know that there are better. I had experienced a lot of the products before in my workplace, and I just thought mine are going to be ten times better. I don’t have to touch them and feel them and look at the research. So one of the things I kind of did wrong or I kind of had the field of dreams vision, like if I build it, they will come. But like especially with my website, I just thought, hey, if I put this out there and it’s the best, then people will just come, and that’s not really the case. People don’t know about you, it takes a long time to spread that word, but I just kind of was naive and just went for it, which to this day I don’t regret, but that was just who I was. Steve: So what platform did you ultimately launch from? Was it your site, was it Amazon? Chelsea: Yes, so we started just making a website before I even had the products finished, just because I thought, hey, this is fun, it’s something I can figure out before. And so we just started selling on eBay, and yeah and we didn’t know about Amazon at that time. And within like the first month I think we sold like $700 or something like that. And so I was like, hey, this is working like people are finding these things and leaving me great feedback already. And it just kind of was surprising how fast it started, and then before I knew I was making $3,000 a month on eBay, and realized that that was probably a lot more than my website. So just realizing that it was going to work and I could keep that pace by myself, and just kind of started slowly scaling. Steve: Okay and I remember doing your site critique actually. You had all this great site, you had an incredible value proposition, and it was just a matter rearranging things. Chelsea: Yes and I realize now looking back how it’s hard to know how to market or like what’s so special about your products when that’s not my background. My background was in creating things, and that was great to get an outside perspective and just be able to say, oh my gosh, how could I not put those things right out there on the front page? Steve: Let’s talk a little bit about how you got a retail presence. So I know you’re in a bunch of Mom and Pop pharmacies. How did you approach that? Chelsea: How did these people find you? Chelsea: They’re great, but then actually doing that, at that time we were shipping these products with a card about our personal story, a card about the rest of our products, kind of like with a little coupon, a card saying — or a piece of paper explaining the regular directions. And then the one that was unique to the products. So it’s four different little pieces of paper, all folded up, put inside of a bag, and then put a sticker over. So, that that was our packaging at that time. And so it wasn’t really feasible for us to say yes, we realized if we were going to go retail, we need the packaging to say it all for us so that we don’t have to be buying these little postcards, and buying this piece of paper and folding in stickers. So that was a big struggle for us was the packaging. It needs to look great on a shelf, it needs to have the unique value proposition just right on there, it needs to stand out. And so it took us like two years to get to the point. Yeah I mean staring at a blank box is pretty daunting. Steve: I don’t remember if it shipped in a box actually, when you shipped it to me, I don’t think it came a box actually. Steve: This is one thing that’s not done in the US, right? Chelsea: Yes, so are our boxes are made in the USA, printed in the USA, but yeah that packaging, and then having to come up with the funds for it. Steve: I’m just really curious since we’re talking about a product, like did you design the pattern and everything yourself? Chelsea: Yes, so everything is me, and I’m not saying that like I’m bragging because some of it is probably really lousy. Like the logo is me, the website is me. It’s just kind of one thing at a time. So yeah all the patterns on the products, yeah everything is completely unique. Steve: I’m just curious, did you ever get any quotes from like factories in overseas at all? Chelsea: No because at that time just for example like I have my long wrap here, and it sells for $31 online, and it goes on the back, the head, and the knee, the ankle. It’s very universal, great product, but from start to finish the pieces that go into it are like $4, and this is the highest quality fabric. Now that we are very pretty efficient, we’re still sewing the labels on by hand, which that takes quite a while, but we can whip out a 100 of these things in a couple hours. So just for us they are so heavy that shipping wise, we never went that route. We looked at alternative products and what they were costing, and we thought, we can do this pretty close and we know it’s going to be right every time. Steve: Okay and then in terms of just the made in USA is probably a big factor also, right? Chelsea: Yeah definitely although you know local wise I get a lot of negativity I guess you can say when I’m trying to sell this and promote it locally. They’re always, oh that’s so cute, you’re a little mommy that sits in her house and makes things. They will compare me to like, oh my friend makes candles, so that’s really cool that you make hot bags. But people don’t realize that it’s — well we are shipping these all over the world, and we have quite a following on. So I get a lot better reception when I’m dealing with the professional market. Steve: So you sell to these small pharmacies, how has that been for you? Chelsea: Good, so we’ve already — getting repeat orders and within a month is definitely showing that it’s working. We wanted to start there first to make sure that we’re not getting customer returns, make sure that seeing what’s selling. And so that’s been a great avenue for us so far. We are just in a few little ones and getting repeat orders and having them sell out of things is like, wow, this is this is exciting, this is happening. So makes us kind of say, okay this is working, and now we need to just be more aggressive and go further. Steve: So what has been working, like if you were to rank, I guess is retail something that you plan on expanding more into? Chelsea: Yes definitely, so just because our products are so inexpensive, it’s a lot of work for us even if we have ten orders to do ourselves and fulfill ourselves. It’s a lot of time for making $20 a time to ship out individual products. So we’re definitely focused on the big box retailers right now, and trying to be more aggressive in that area. Obviously I have a background in medical. I don’t think any other orthotics designs hot and cold therapy wraps. So it kind of sets us apart in that way. So we are hoping that — we got contacted by Albertson store. Chelsea: Yeah, so that’s very exciting for us. They reached out to us from rangeme.com which is kind of a wave to get your smaller products in the eyes of bigger box retail stores. But the problem is with the bigger stores, they only do their assessment and their viewing of new products like once a year. And so it’s just a long process for all these bigger places, but we’re definitely we have the margin set up, we’ve done orders of 8,000 gel packs at a time. So we definitely can just ramp production and scale. Steve: Do you have all these equipment at your house; I’m just kind of curious? Chelsea: Yes, so these are all made in-house like literally in my house. Steve: For making gel packs too? Chelsea: Yes, so it’s not as technical as you’d think, but we have all the equipment, it’s set up in my shop, and then my employees each have their own designated jobs. And throughout the week, they’ll do their parts at their own houses. So we have the lady that does the gel packs for us, she has all that equipment at my house and at her house. And so when she gets free time or puts in some hours, she probably works like 30 hours a week for me. So she’ll get that set up and make a whole bunch of gel packs, bring them over here with box roll up and…. Steve: Do you have a very large house Chelsea, I’m just curious? Chelsea: Well we lucked out, we were living in a 1,000 square foot house, and we had three kids and it was really crammed, and that was also my business headquarters. So we lucked out and two years ago we found a foreclosure house and it’s 3,500 square feet. And so yeah, now we’re set up. It was like God was planning this house for us because I don’t know what we would do if we were back in that 1,000 square foot house. We were having to buy, get storage units and work out of storage units, because it was kind of overflowing us. What’s worked the best for you in terms of marketing your business, is it the retail side, Amazon, eBay, your site? Chelsea: Oh my gosh, well I’m terrible at marketing. Right now we don’t like pay very much for advertising or anything, so pretty much word of mouth is going to be hugest force. And we will get people ordering ten products at a time just from hearing about somebody. Or my doctor recommended this, and I’m like, cool, I’d like to meet the doctor, or obviously people are talking and sharing all over the United States. And so that’s just been huge, and then we do a little bit of like pay per click advertising on Amazon just because it’s so available for me, and I have a lot of other areas I could be spending my time. And so that works really well. All of my products have great numbers, so I’d say just me just doing whatever Amazon recommends, and just me giving them money. My ACOS or whatever is like 10 to 15%. Steve: Okay, build your product and Amazon sends you money. Chelsea: Yeah, I say more sales is good, and now we’re at the point because we — just getting this retail packaging in May, I thought, oh well then we’ll be ready. But unfortunately what happened in May was we switched our UPC numbers, and so I created new product listings and merged them. And unfortunately that started me over at zero. Steve: Oh man, that’s terrible. Steve: Where do you rank now for switching up the UPCs? Chelsea: What was what, I’m sorry? Steve: Where is your rank now? Chelsea: Because I lost like the numbers and the codes and it just started changing our product numbers and everything, making it more easier for stores. So looking back, I probably wouldn’t have done it, because I didn’t know that was going to happen. But just to have a print on the boxes and stuff like that is a little bit — but yeah, so when we started over at zero, so we went from making like $9,000 and $10,000 a month to like one. So when I figured that out, it took me a while, and then of course we were closing out old inventory and sending them in new boxes. It’s just hard for when you’re still starting out to just; okay here is $40,000 worth of inventory to just sit there at your warehouse for now. So it’s taken us until about now to get things in stock. Steve: Did you have to get it, take out any loans to kind of fan this inventory at all or? Chelsea: We took — for the first $7,000 loan; we paid back within a few years. And then at that point we just decided, hey, this is working and I want to make a million dollars. I don’t want to just sit at home and make gel packs for myself. This is big enough to go into the retail store. So we took out the max loan that we could get our hands on, it was $20,000, and so that was what we did. And we wanted new custom bags with the gel packs, we wanted them to be — the bags to be made in the USA with our logo, and the heating and cooling directions printed on the bag. And so we had budgeted for that as well as the retail packaging. And we asked them, can you please shoot for an under run, like this is maxing out our money. And they of course went over by thousands of bags, which we were under contract to buy. So that used up our entire loan, so then we were sitting there with a bunch of bags that we couldn’t sell in stores because we didn’t have the packaging, because we couldn’t afford both. Steve: But you are back on truck now, right? Steve: Wow that’s quite a story. I’m just curious, and so on the retail side, are you discounting by giving them wholesale prices on their order like 50%? Chelsea: What are the terms that you’ve given them, like what’s the minimum order? Chelsea: For a minimum order, we only have like 300 is the first minimum order, and then subsequent minimums are like $200. So that keeps it so that if they’re looking at the shelf and thinking, oh it’s getting a little bare, do I really want this or not, $200 is definitely doable. Steve: Yeah that’s not much at all actually. Chelsea: Yeah so and then if they — free shipping if it’s $400 to $500. So that allows us to keep, you know just make things work for us. Steve: It seems like you’re very focused on product, right? Chelsea: Yes, so and right now — at the beginning we thought, well, we should probably get somebody to sell these, and have somebody go to the doctor’s offices and sell these. And I’m like seven and a half months pregnant right now. Chelsea: And so it’s just not — it doesn’t have the right message to have me just walk into these places, oh this is our company, and feel free to order thousands of dollars because we’ll be able to fulfill. It just doesn’t have the right message. So we’re looking to have somebody kind of fill that role for us right now. Steve: So let me ask you this Chelsea, I mean it sounds like you’ve underwent a lot of hardships with this business, is this something that you would repeat like if you had to start all over again, would you still start your business? Steve: Okay and you’re going to have four kids, right? So does it provide you with freedom? Chelsea: Definitely, well and I mean and I’m not — some of my faults are definitely not just being super gung ho. I’m like you know I look at other companies, and they’re just really going, going, going, and I think you know what, that’s not always my goals, and that’s okay. So if it’s — this year if we’re just going to make a few thousand dollars, and I get to spend time with my kids and have another baby, then that’s fine, and I don’t think everybody has to just be like 900% all the time. So I guess definitely given me freedom to do what I want. And then when those times come where I get the huge shipments of stuff, and then it can be go, go, go for a while. So it’s my own pace and my own thing, and so sometimes I’m putting in 40 hours a week, and other times I’m putting in 20 hours a week. Steve: So I mean it sounds like you started your business for both the acceleration factor and the fact that it kind of allows you to free up your time so you can spend time doing what you want to be doing? Chelsea: Yeah definitely yeah. I mean I created the first product myself for a business that didn’t appreciate it, and I thought, man, you just don’t — and then I lost my job, I thought this is crazy. I’m working so hard and no one’s appreciating me. And I thought, if I work so hard for me, how exciting would it be to be able to own all of it and to take it all the way. And I definitely think this product is going to be on major store shelves in the future. Steve: I believe it too actually. I’m a firm believer in your product Chelsea. Steve: I’m just curious though, so for some of the listeners who are out there who are wanting to start a business, like what — I mean it sounds — all the students that I’ve interviewed on the podcast, it sounds like you have experienced the greatest hardships. So from your perspective like what’s some advice that you would give the people listening who are kind of on the sidelines right now who might want to start something? Chelsea: Well yeah, I mean we started this business not — we started out of a necessity because I needed to provide for my family, like literally I needed to provide food on the table. And so I was like I have to make this work, every month I have to have a profit or we don’t eat. And so it’s also, it was kind of exciting to do it like that. It gave me a lot of instead of focusing on, oh gosh, my husband is sick, we have kids, I lost my job. It was like, I am a business owner, it might not be a good business yet, but it’s going to be. So I would say if you’re going to think about doing something, just know it’s going to be a lot of work. No one can do it for you, no one is the expert. You can go to people that know what it’s like, who am I supposed to go to if one of my materials fails or something like that? Nobody else knows this stuff. And so you just kind of either have to be confident about it and know, hey, I’m going to be able to make this work, or take a step back and re-evaluate. Steve: I mean what would you say was your main struggle, and like what would you change if you had to start all over again? Chelsea: Oh gosh so many things. Well I would just — it’s like you get tunnel vision sometimes thinking, like I had originally planned these products completely different. I was using a radio frequency machine to custom cut the plastic, and it was a special kind of plastic, and it was not working out, but I wouldn’t give up the idea. It was like, okay, I have put this much money into it, it is going to have to work. And so it was hard for me to let go of the what wasn’t working. So it’s okay, it’s kind of like a tree with the leaves are going to fall off and die, and it’s okay to let them fall and focus on new leaves. So if I had it to do over again, I probably would just not be so focused on exactly how I want, maybe to take a step back and go, okay well, how am I going to do it now, or what if that wasn’t an option, and just you know focus on how to change it. If it’s not working, then it’s going to have to — you got to fix it fast. Steve: Okay, well Chelsea where can people find your products, and if they have any questions for you, where can they find you? Chelsea: Yeah, so I am at — my website is lifeandlimbgel.com. So that’s lifeandlimbgel.com. And we also sell on Amazon and eBay, and then we are in a few pharmacies, but they’re very local, we live in the Pacific Northwest. So hopefully we’ll be on the store shelves here, or maybe you’ll see me on TV soon. Steve: We didn’t really talk about that, but maybe if that happens I’ll have you back on. Chelsea: Yeah, so we have some things in the works right now to be featured on a television show similar to Shark Tank. We applied for Shark Tank last year and we made it to the second round which is really exciting, and then this year we got contacted by a different company with a Shark Tank like story. And so we decided not to pursue Shark Tank this year just because the other opportunity sounded so much more fun for me. And so we’ll see what happens with that, but if not, we can always reapply this year. Steve: I can’t wait to hear about it. Steve: All right Chelsea, I really appreciate you coming on the show, take care. Chelsea: All right thank you so much. Steve: Hope you enjoyed that episode. What I like about Chelsea is that no matter what hardships have been thrown at her. She’s persevered and created a profitable online business that she can be proud of, all of this with four kids as well which is pretty crazy. For more information about this episode, go to mywifequitherjob.com/episode189. And once again I want to thank Privy for sponsoring this episode. Privy is the email capture provider that I use to turn visitors into email subscribers. They offer email capture, exit intent, and site targeting tools to make it super simple as well. And I like Privy because it’s so powerful and you can basically trigger custom pop ups for basically any primer that is closely tied to your e-commerce store. If you want to give it a try, it is free. So head on over to Privy.com/Steve, once again that’s P-R-I-V-Y.com/Steve.